The Mexican Street Bowl, a signature menu item at all four locations of Puesto, features seasonal tropical fruit, cucumber, jicama, mango, chamoy and lime. Kitchen staff purees the leftover fruit to use as a base for the Fruit Cart Margarita. The cocktail, which also contains tequila, agave, lime juice and sugar, was developed by Beverage Director Lucien Conner to minimize waste and utilize surplus fruit. 1. Prepare fruit cart puree: in blender container, combine watermelon, mango, pineapple and cucumber. Add sugar and water; blend until smooth. 2. Measure 1 ounce puree into cocktail shaker. Add tequila, agave, lime juice and chamoy; shake to blend. 3. Pour drink into glass tumbler. 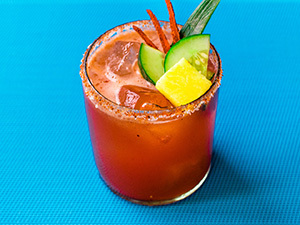 Garnish rim with chili seasoning and surplus fruit pieces of your choice.